Long-awaited for its own sake and its historical significance – never for its good looks – the Airfix 1/48 Walrus is on store shelves now. The Walrus first flew in 1933, having been shaped by the hand of Reginald Mitchell, whose vision also gave us the rakish Spitfire. The Walrus was designed originally for the Australians. An all-metal hull (okay, fuselage) and the pusher prop differentiate the Walrus from its predecessor, the Seagull III. The metal hull made the Walrus sturdy enough to be catapulted off a capital ship, and to land on lively seas for rescues. 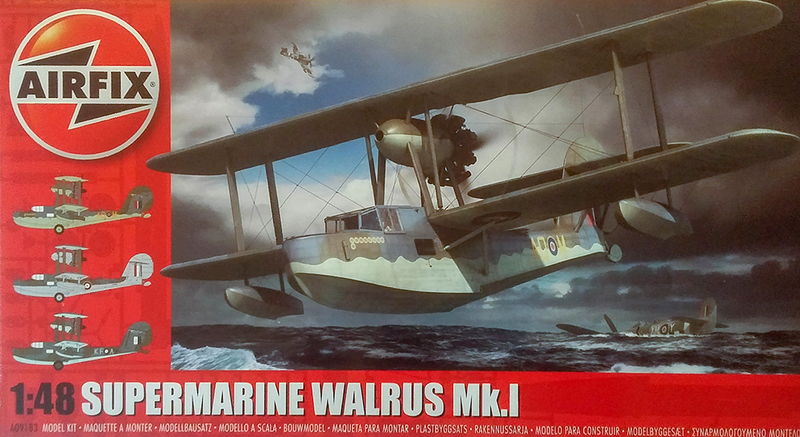 Walruses served in all the Commonwealth air forces throughout the war, on SAR and ASW patrols. This slow, stable airplane found peaceable work postwar such as aerial mapping in Canada. Eventually some weary Walruses were shorn of all their flying surfaces and became residential river barges in England. The sturdiness of the real airplane has been sustained in the model. Two stout one-piece X-brackets support the engine and the top wing for a positive, strong alignment. The top wing assembles onto a center section with long, thick spars, and a corresponding part gives us the option of assembling the bird with wings in the stowed position. The space inside the bottom wing root is modelled in thorough detail, but if you choose to build a Walrus with the wings extended, a pin arrangement will securely attach the bottom wings. It requires drilling; looks to be about 0.125 in. (3 mm). All the control surfaces are positionable. The fully exposed engine comprises lots of convincing detail. You can choose to install a flight deck canopy with several open windows in it. The interior detail is elaborate and includes some equipment only found in water-landing aircraft, notably reels for lines used for hauling rescued swimmers aboard, and/or for mooring. The spacious main cabin has a navigator's station with a table. There's a helpful diagram for rigging. One online writer has called the Walrus a rigging job from Hell, but it's not. There's acres more space to work in than on a Nieuport or a Camel, and about a third as many lines to run as a Jenny. You get a decals and pretty color plans for two RAF paint schemes and one RAAF airplane, complementing loaded-for-bear underwing bombs and depth charges. The instructions are printed in two colors with great shaded illustrations, as in other recent Airfix kits. Everything in the box makes a wonderful impression. The parts just beg you to start, promising a Tamiya-precise buildup. There are 157 parts, nine of them clear, and the rest on five gray sprues. This is the definitive Walrus for the foreseeable future, and preceding 1/48 Walruses from two other brands don't even bear mentioning, so I won't.